The Complement Naive Bayes classifier described in Rennie et al. (2003). The Complement Naive Bayes classifier was designed to correct the “severe assumptions” made by the standard Multinomial Naive Bayes classifier. It is particularly suited for imbalanced data sets. Additive (Laplace/Lidstone) smoothing parameter (0 for no smoothing). Only used in edge case with a single class in the training set. Prior probabilities of the classes. Not used. Whether or not a second normalization of the weights is performed. The default behavior mirrors the implementations found in Mahout and Weka, which do not follow the full algorithm described in Table 9 of the paper. 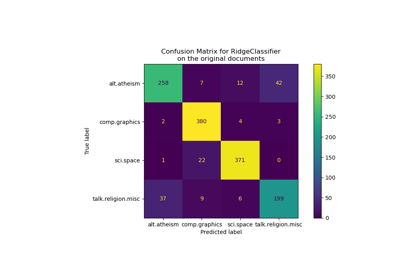 Smoothed empirical log probability for each class. Only used in edge case with a single class in the training set. Empirical weights for class complements. Number of samples encountered for each class during fitting. This value is weighted by the sample weight when provided. Number of samples encountered for each (class, feature) during fitting. This value is weighted by the sample weight when provided. Number of samples encountered for each feature during fitting. This value is weighted by the sample weight when provided. partial_fit(self, X, y[, classes, sample_weight]) Incremental fit on a batch of samples. predict(self, X) Perform classification on an array of test vectors X.
predict_log_proba(self, X) Return log-probability estimates for the test vector X.
predict_proba(self, X) Return probability estimates for the test vector X. Weights applied to individual samples (1. for unweighted). Incremental fit on a batch of samples. This method is expected to be called several times consecutively on different chunks of a dataset so as to implement out-of-core or online learning. This is especially useful when the whole dataset is too big to fit in memory at once. This method has some performance overhead hence it is better to call partial_fit on chunks of data that are as large as possible (as long as fitting in the memory budget) to hide the overhead. List of all the classes that can possibly appear in the y vector. Must be provided at the first call to partial_fit, can be omitted in subsequent calls. Perform classification on an array of test vectors X. Return log-probability estimates for the test vector X. Returns the log-probability of the samples for each class in the model. The columns correspond to the classes in sorted order, as they appear in the attribute classes_. Return probability estimates for the test vector X. Returns the probability of the samples for each class in the model. The columns correspond to the classes in sorted order, as they appear in the attribute classes_.